I haven’t been to many nightclubs where I could feel at ease and became friends with some people at the bar or on the dance floor. I’m referring to the Sture Plan area, where ‘posh’ often gets preference over ‘regular’ and the Stockholm elite gets accepted at the door rather than the ‘casuals’, which really bothers me. But hey, that’s just my personal experience. Luckily there are some places a bit out of the core city centre that are easy and fun and where everyone is just treated equally as long as they respect one another. 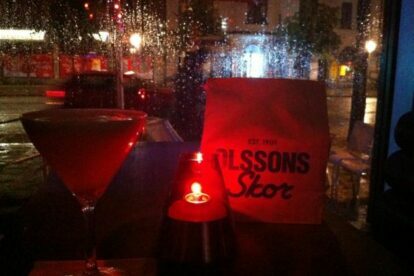 At Olssons I had some of the most fun nights in my nightclubbing career as a Stockholm party newbie. Easy access to request songs with the DJ, free popcorn as a late night snack and friendly staff, plus an easy and enjoyable atmosphere. It can get quite crowded though which can make the way to the bathroom (not to mention the queue) a bit of a challenge, but then again, people are not too shy to chit chat and make time go faster. The range of drinks is pretty much as standard as at any other average bar, but the prices are slightly more acceptable. So, if you feel like a dance during weekdays in a great and fun place, this is the way to go!